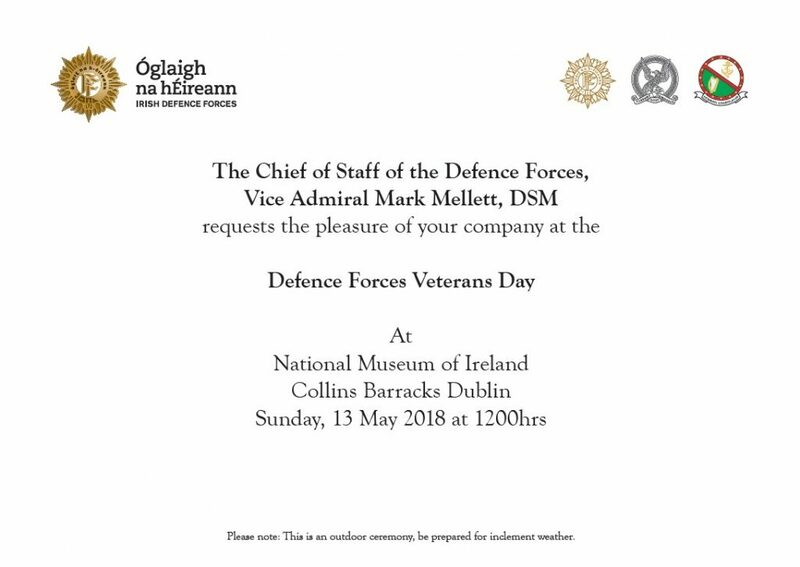 The Executive Committee of ARCO has accepted an invitation on behalf of its members from the Chief of Staff of the Defence Forces, Vice Admiral Mark Mellett DSM, to attend the 2018 Defence Forces Veterans Day. This will be held in Collins Barracks, Benburb Street, Dublin 7 on Sunday, 13th May at 1200 hours. A representative group from each of the three national organisations (ARCO, ONET and IUNVA) will parade on Clarke Square to be reviewed by the Minister with Responsibility for Defence, Mr. Paul Kehoe, TD. Light refreshments will be available in Collins Barracks before the ceremony, which is open to all veterans and to their families. A post-event reception will be hosted in McKee Barracks Dining Centre. The Executive Committee encourages ARCO members to attend this event and to wear their medals. Members are requested to participate in the ceremony and are asked to report to Clarke Square by 1100 hours. Members who are not parading for the ceremony should be seated by 1140 hours.